Last week, the folks from Rocky Mountain Flatbread, one of my favourite local pizza places (and a kid-friendly spot to boot!) 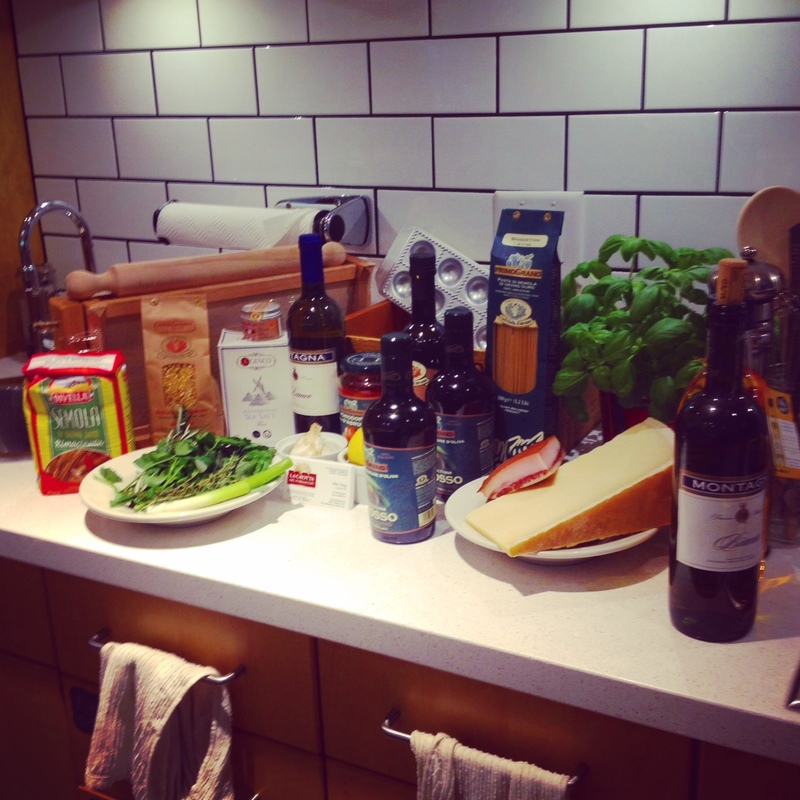 invited me to sit in on a cooking class with Alex Tung, a Vancouver-based chef with international credentials and a flair for all things Italian. Given that it was a rainy Thursday and there were plates of pasta a chef would make for me while I watched, it didn’t take much convincing. 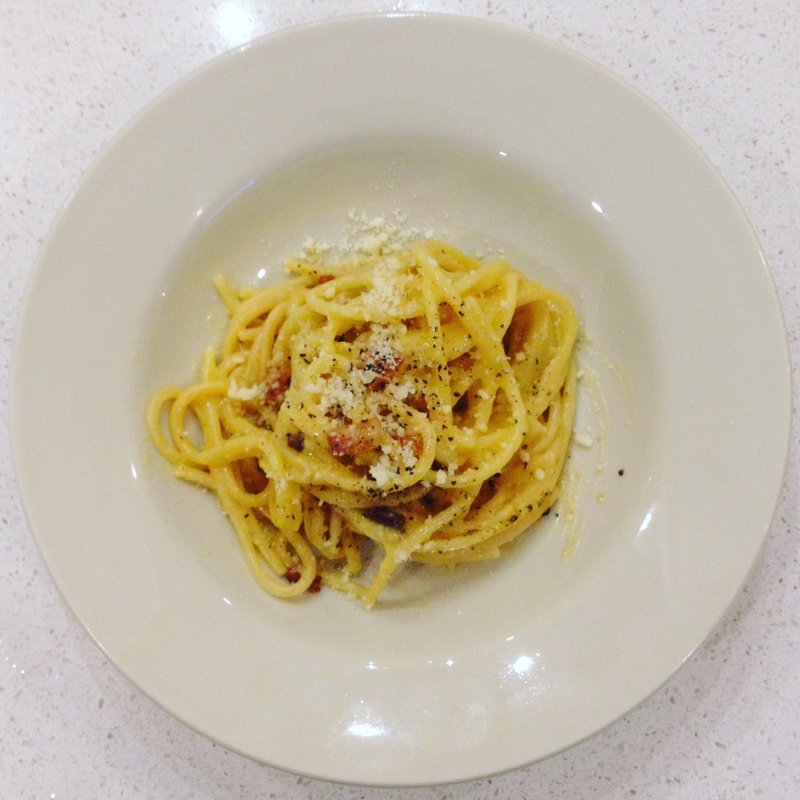 Chef Tung made three dishes: a luscious pomodoro sauce over a fresh pasta he likened to Italian udon, a fregola dish with clams and fresh tomatoes, and Spaghettoni alla Carbonara, a version of which is described below. The class was part of a fundraising initiative on behalf of EarthBites, a local program that teaches children in schools about food and nutrition. It’s an issue that’s timely and particularly pressing for urban kids who may not have access to gardens at home. Every year, EarthBites goes into schools to teach thousands of kids how to grow and cook their own healthy meals. The children are instructed by a dedicated team of urban growers, nutritionists and entrepreneurs who are passionate about engaging children with the food they eat. You can support EarthBites (and maybe learn something new!) by participating in one of their “watch and learn”-style cooking classes with local chefs, including Top Chef Canada contestant Dawn Doucette, and Chopped Canada winner Alana Peckham. Classes run through the fall; visit their website to learn more. I love getting a few chef-tested recipes to play with at home, so between that and the food and the cheffy banter, this was a winner for me. 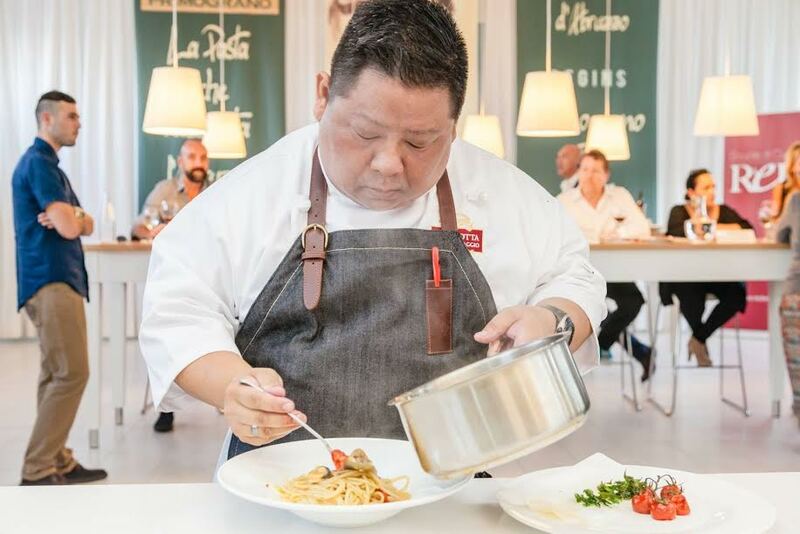 To whet your palate, here’s a recipe for Spaghetti alla Carbonara from the class I took with Alex Tung (pictured above), an award-winning French-trained chef with a passion for Italian cooking. If you can’t find guanciale, available in Italian delis and specialty stores, use pancetta or bacon. If you can find smoked hog jowl, it’s comparable (but smoked, which guanciale is not), and generally a bit cheaper. In Vancouver, Buy Low Foods often has smoked hog jowl for around $3.50 per, which – at about a pound per piece – I generally can make work for two meals. 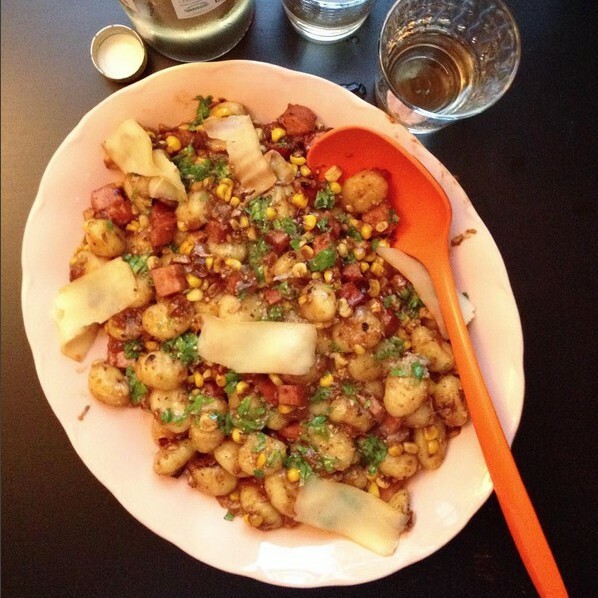 While we’re on the topic of kids and food, you might like to know that this dish was picky-eater approved. The kid practically inhaled it, and requested it for lunch the next day, even though he hates cheese and everything else that is savoury and delicious. Dear Alex, I love you. In a large pan over medium heat, cook diced guanciale until crispy and until fat has rendered, three to ten minutes depending on the size of your dice. Meanwhile, heat a large pot of generously salted water to a boil. Chef Tung insists that it must taste like sea water; he is right. Cook pasta according to package instructions, about seven to nine minutes until al dente. Between the salted pasta water, the pork and the cheese, it’s likely that you will not need to season the dish with any additional salt. While your pork and pasta work their magic on your stove, beat eggs and egg yolks in a small bowl. Add cheese, and whisk to combine. Set aside. If your guanciale cooks quicker than you expected, remove it from the heat but leave it in the pan to keep the rendered fat liquid. When pasta is ready, scoop out about a cup of the cooking water. Drain the pasta, then return it to the pot but do not return the pot to the stove. Add the guanciale and its rendered fat (like, all of it), stir, then add the egg mixture, stirring well and quickly. 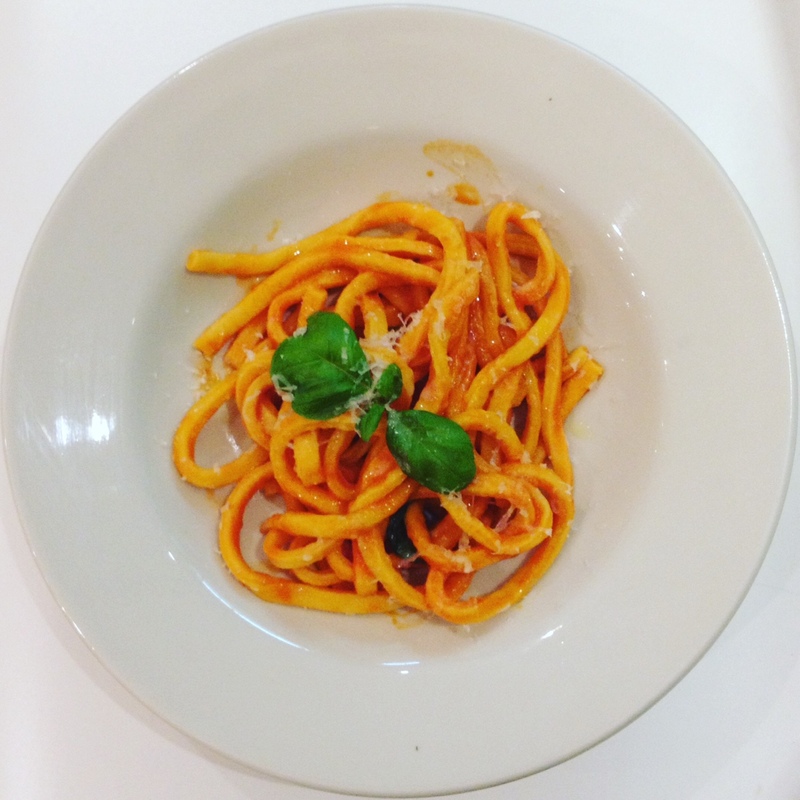 Stir in the water, about a quarter of a cup at a time, until the pasta is coated in an satiny sauce. Taste. Does it need salt? Add salt. Scoop the pasta into bowls, then sprinkle liberally with black pepper. Serve immediately. Learn more about school programs and adult cooking classes at earthbites.ca. This post wasn’t exactly sponsored, but I did get to take the cooking class for free. No one told me what to say, but I think the assumption was that I would say something good? I don’t know. Maybe no one should ever assume that of me. I can be a real jerk. I keep thinking I’d like to take up embroidery (in the style of Judi Dench), because it seems like such a normal hobby to have. And because gut bacteria is starting to seem like a weird thing to dwell on and Nick thinks that “healthy poops for the whole world” is not a hobby, but the kind of thing I should talk to a mental health professional about. I think Nick is ungrateful. Yes. Embroidery. That seems like something I could talk to people about. Because right now, I’m talking a lot about kefir and lacto-fermentation and gut flora and getting a lot more side-eye than even I’m used to. Every day, it seems, some study out of somewhere implicates intestinal bacteria in some seemingly unconnected disease or disorder, demonstrating that the relationship between our health and what we eat is increasingly complex. A lot of nutrition information tries to sum up healthy eating in a few easily digestible tips and tricks. (Wink.) This is, I think, where phenomena like “super foods” come from – the idea that optimal nutrition is based on a simple formula, and if you just eat a carefully selected limited number of things, you will live forever. That’s a nice idea, and I can see why people are into it. Unfortunately, there is no simple one-size-fits-all approach to nutrition. Your best shot at a healthy diet is a diet that includes a little bit of everything and nothing to excess. Which is great, because I don’t think I could live a lifestyle that excluded a reasonable amount of Taco Bell. 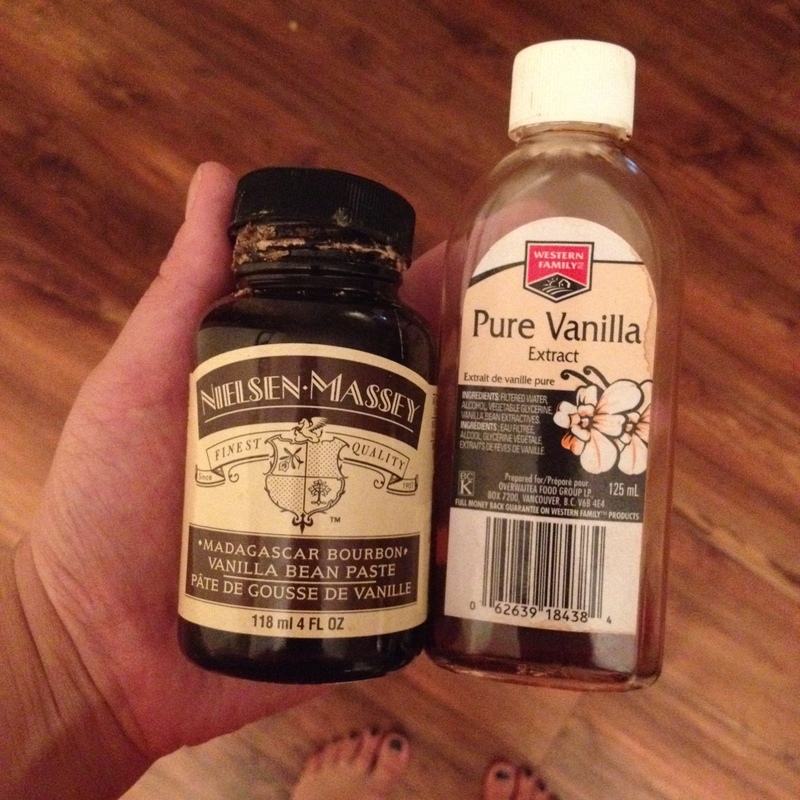 Our weird health kick is kefir, which I make because making yogurt involves too many steps. You just fill a jar with some kefir grains and milk, then strain off the grains and start all over again with new milk, either refrigerating the kefir for consumption or secondarily fermenting it with citrus peels for even better taste. We drink kefir because it makes our bellies feel nice and because it’s easily blended into things I can drink for breakfast, since I’m bad at wanting or remembering to eat breakfast. Some kefir and some frozen berries blended and poured into a tall glass is something I can consume in a rush while doing ten other things. Kefir and yogurt are both full of good bacteria, but kefir contains roughly three times the amount of probiotic cultures. Whether that matters for long term health is unclear, but in the short term, it can be helpful; this week Toddler’s had an ear infection, and the amoxicillin the doctor prescribed can be hard on little bodies. The pharmacist’s advice was to load Toddler up with probiotics, either in the form of yogurt or supplements. And so, the kefir was useful once again. Of course, he was unlikely to take a shot of kefir … especially not when the amoxicillin was bubblegum flavoured. So we came up with this frozen yogurt/sorbet-like thing, and he declared “it’s perfect, mum!” and ate enough to keep his little gut happy. Maybe embroidery would be more socially acceptable. 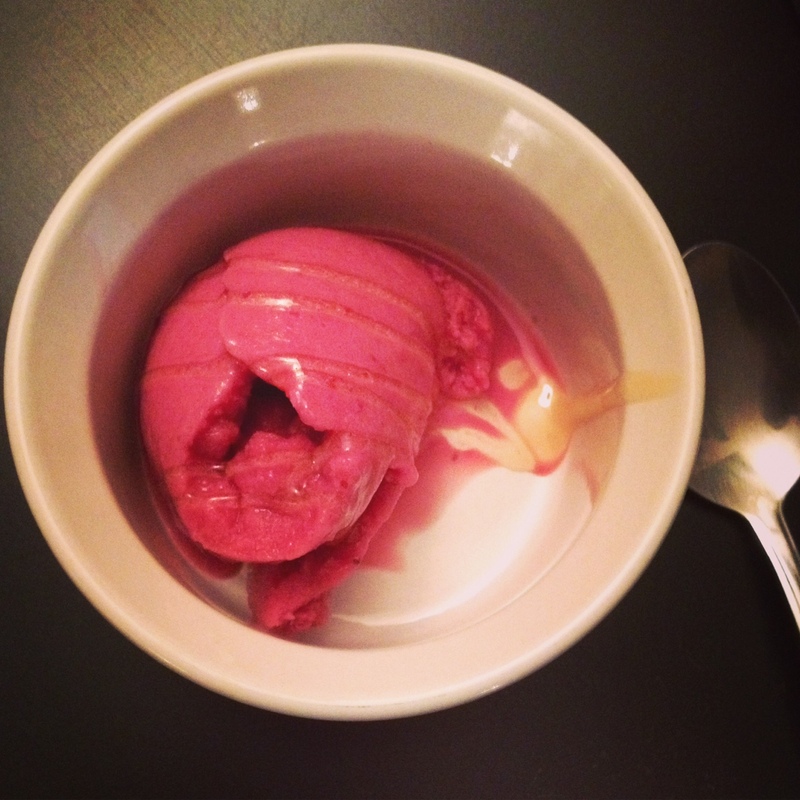 But probiotic ice cream is worth telling people about. Healthy poops for the whole world, indeed! 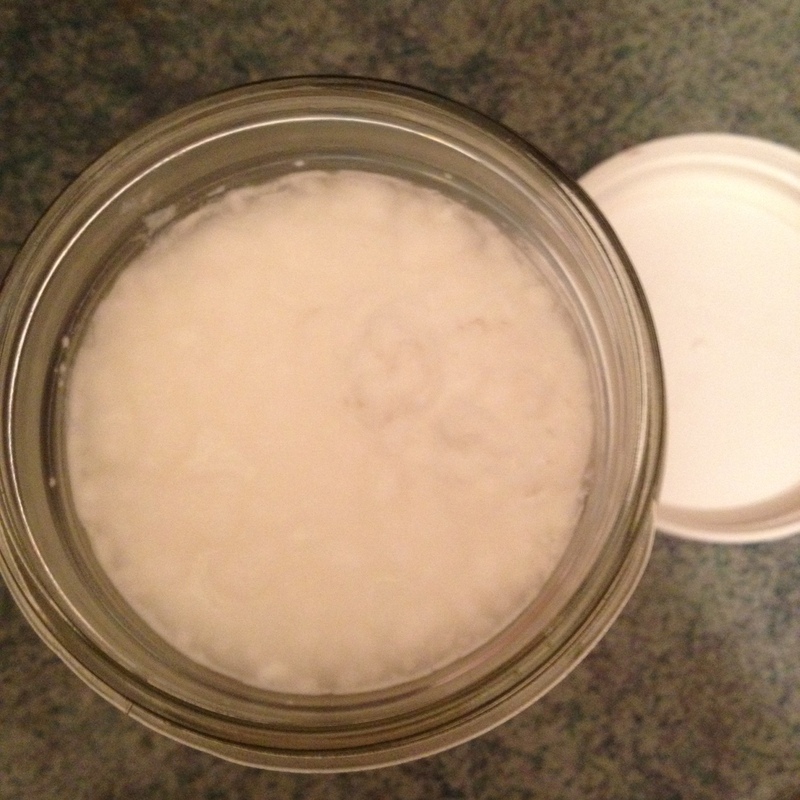 If you make kefir, let it ferment twice. To do this, make the kefir first, then strain out the kefir grains and let the kefir continue to sit at room temperature for an additional 24 hours, either as it is or with a strip of orange or lemon peel. Whisk kefir, blackberries, honey, and vanilla in a bowl until thoroughly combined. Chill in the fridge for 30 minutes, then process through an ice cream machine as per the manufacturer’s instructions. Freeze for at least one hour before serving. If freezing for more than four hours, let the dessert sit on the counter for ten minutes before serving. Serve with an additional drizzle of honey, if desired. Sometimes you just want to eat the food you grew up with, the kind of stuff that hearkens back to a time when cheese was powdered and that was okay. Remember when Parmesan cheese came in its own plastic shaker and was shelf-stable? I think it was made of nylon. I have always loved macaroni and cheese, and for most of my life macaroni and cheese was something that came in a box. It never would have occurred to me to make it from scratch until a few years ago. 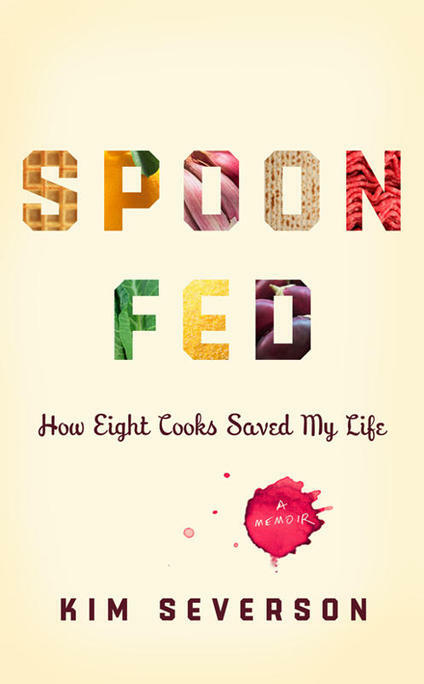 When I moved out of my parents’ house and into my first “apartment” (translation: dank basement suite with limited natural light and a permanent damp smell), I was broke all the time and would maximize my calorie intake in the days before payday by cooking up a box of macaroni and cheese (remember when it cost less than a dollar?) and eating the whole thing super fast, then laying face-down on the couch, uncomfortable, to digest for the rest of the evening as though I were a snake that had just swallowed an antelope. It was an attractive time. It felt horrible, but it was oddly comforting. When I was a kid, even though we always had Costco cases of macaroni and cheese in the cupboard, it was a total treat, especially if you got it for dinner which almost never happened. I loved macaroni. And in my formative years, macaroni and cheese was always, ALWAYS orange. 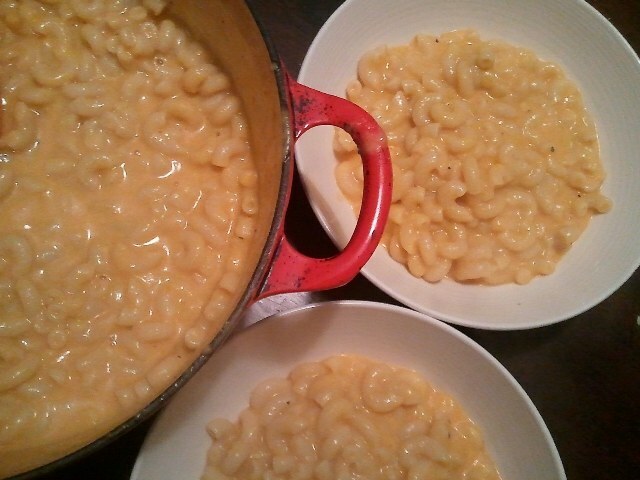 When you make macaroni and cheese from scratch, it is mostly not orange, even when you use orange cheese. And while grown-up, from-scratch homemade white mac-and-cheese is extremely delicious, it is more like comfort food to me when it’s orange. But macaroni out of a box is the opposite of comfort food these days; when I eat it now, I feel … gross. But you know what’s orange? Carrots are! Also they are healthy, so you can pretend that’s why you’re using them. Over high heat, bring carrots, onion and garlic to a boil in about two cups of water with a bay leaf and 1/2 teaspoon of salt. 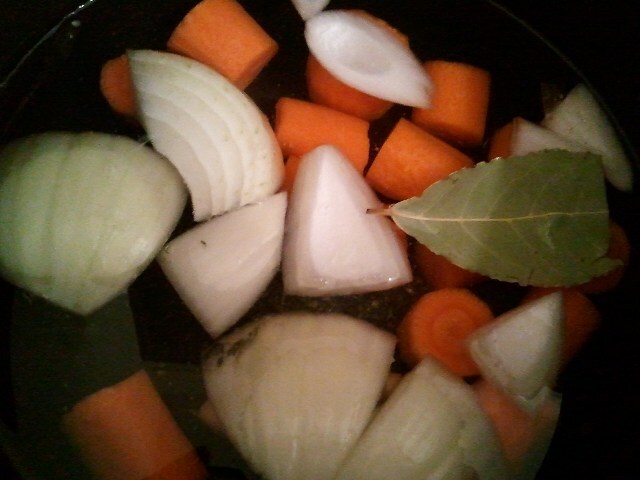 Reduce heat to medium, and simmer until carrots are soft, 15 to 2o minutes. Remove bay leaf, pour contents of pot into a blender, and blend. Set aside. Cook macaroni in salted boiling water according to package instructions. Meanwhile, melt butter over medium-high heat. Add flour and whisk to combine. 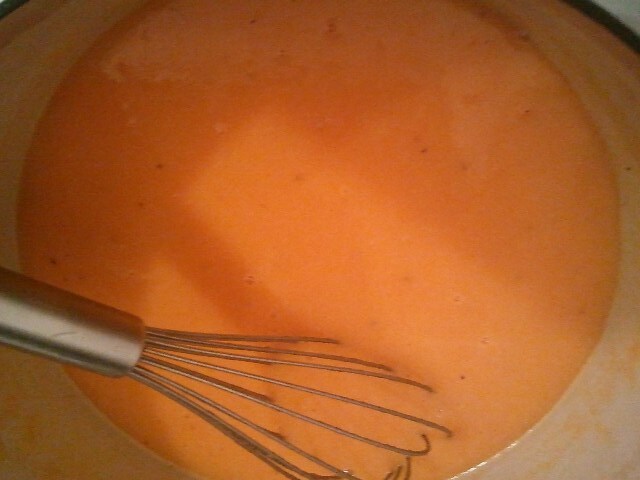 Add mustard, whisking again, then add the carrot mixture. Add Worcestershire sauce, paprika and pepper and simmer – whisking occasionally – until thickened, four to six minutes. Add cheese, stirring to melt. 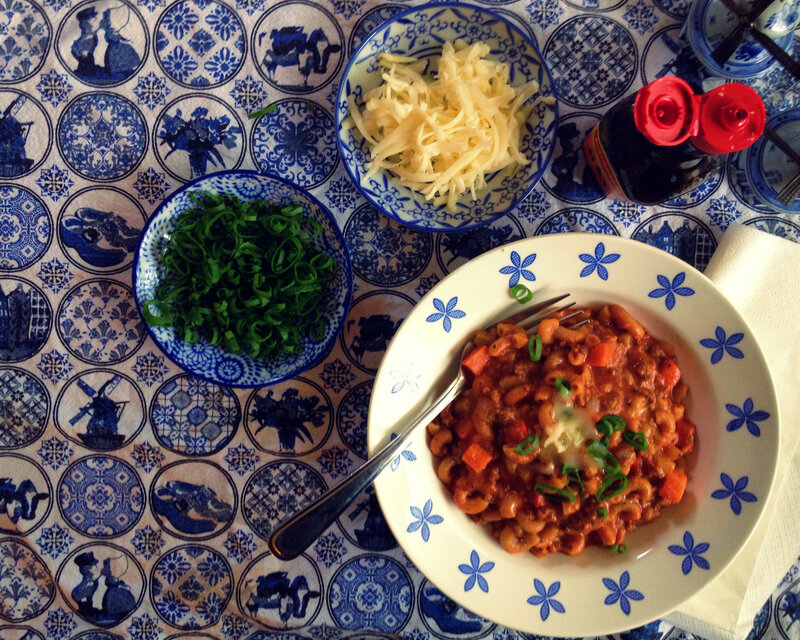 Add cream, if you feel like it – not mandatory, but it gives the sauce a richer, silkier taste. 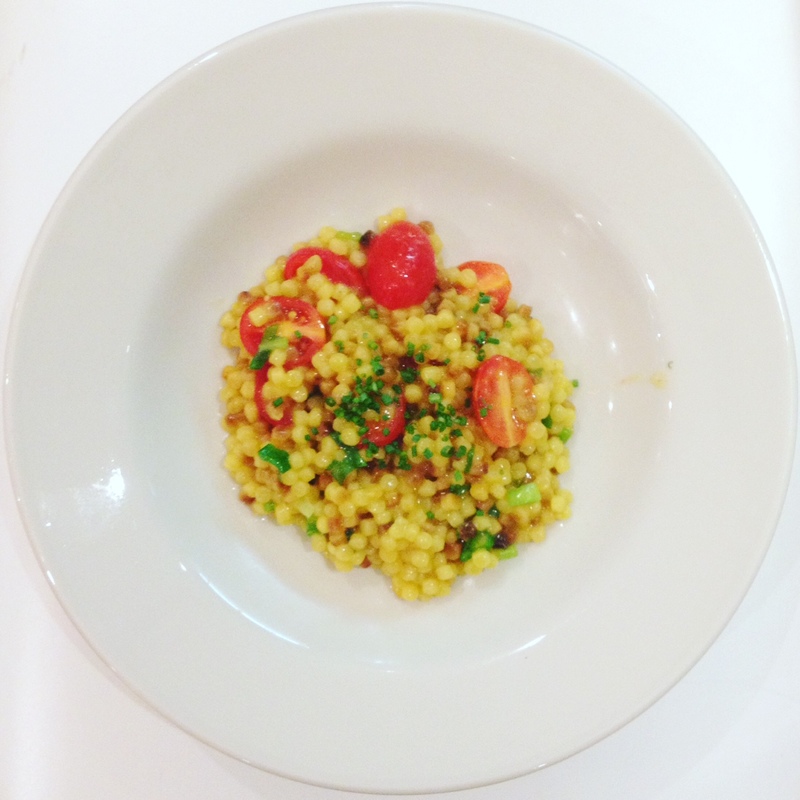 Add any additions – such as hominy, cooked sausage, roasted veggies, or whatever. Taste, adjusting seasonings as needed. 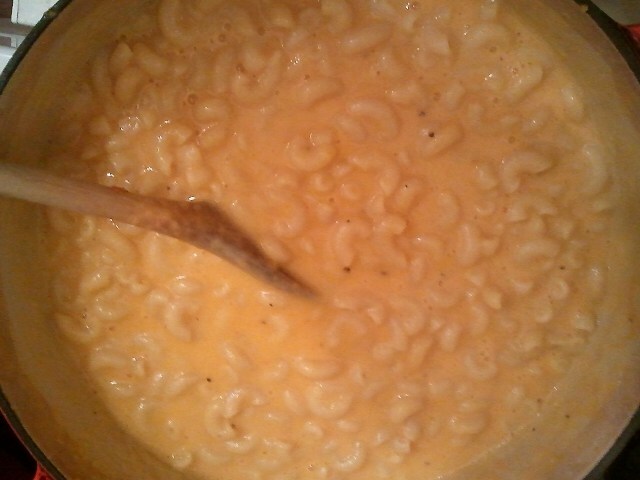 Add cooked macaroni, stir well to coat, and serve. Also, if you live anywhere between West Van and Langley, enter this week’s giveaway! Not a ton of entrants, so your odds are good.